The Lungau is an area in Salzburg, politically it comprises of the district of Tamsweg. The Lungau can be found in a very remote part of the province, about 100 kilometres south-east of Salzburg City. There are 15 municipalities in the Lungau, all of which 14 are situated at altitudes above 1000 metres. 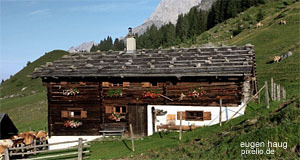 Much of the Lungau is very rural, with 60 alpine lakes, numerous mountain cabins (Almen) and scenic mountains. Summer tourism is less important in the Lungau than elsewhere in Salzburg; the tourism industry, which is of key significance for the area, makes most of its money during the winter season. Places lake Obertauern (belongs partly to the municipality of Tweng) are among the busiest skiing areas in all of Austria. During the summer, hiking is popular in the Lungau. In terms of sightseeing, note for example Schloss Moosham, a castle in Unternberg. It used to be home to the local landlord and a court. Today, Schloss Moosham is a private museum. In the village of Ramingstein, note the Burg Finstergrün, once a ruined castle, later re-built during the Historicist craze of 19th century Austria. It is run as a hostel and offers guided tours. Nearby Ramingstein, there are also old silver mines that are sometimes opened for guided tours on special occasions. Two properly ruined castles can be found in Thurnschall near Lessach (dating back to the 13th century) and the Ruine Klausenegg in Seetal. The latter one was also built in the 13th century and secured the border between Salzburg and Habsburg Styria (Steiermark). The most important sight, however, will be the Burg Mauterndorf Castle, a well-preserved medieval castle that was used as the local residence of the Prince Archbishop (in the rare cases that he showed up). There is a museum, guided tours and special events for children during the summer season. Geographically, the Lungau comprises of the Murtal valley with its side-branches. The Murtal valley extends into Styria. For centuries, the Lungau was nevertheless rather influenced by its Southern neighbour Carinthia. Even the local accent sounds rather Carinthian than like other Salzburg accents. The Lungau has been populated since Roman days, and a few Roman buildings remain from this era - such as milestones or parts of churches. Since the 6th century, Slavonic tribes populated most of the Lungau, which linguists can see in many Slavonic names of villages, mountains or rivers (such as "Lessach"). Many people in the Lungau also have surnames of Slavonic descent, once again a features the area shares with Carinthia. In the 8th century, the Lungau fell under the control of Bavaria and later of Bavaria′s off-shoot Salzburg. In the Middle Ages, the Lungau was a county (Grafschaft) and saw a period of prosperity, mostly due to mining. Important silver, gold and mineral deposits were exploited and the Lungau contributed substantially to the wealth of Salzburg. Life in the Lungau remained hard despite of its natural resources. This was to become even more serious after the mining businesses gradually closed down in the late 19th century. The rise of the skiing industry that took place in much of southern Salzburg soon after the end of WWII did not arrive in the Lungau for a long time. Only when the Tauernautobahn motorway was built across Salzburg′s least developed district in 1976, things were to change for the good. Today, skiing ensures the Lungau of a reliable source of income. If you go there during the summer, watch out for the many local customs and traditions that the Lungau is famous for. The most famous ones are probably the Samson parades. The Lungau has 15 communities of which three are market towns (Mauterndorf, St. Michael, Tamsweg). The other twelve are Göriach, Lessach, Mariapfarr, Muhr, Ramingstein, Sankt Andrä im Lungau, Sankt Margarethen, Thomatal, Tweng, Unternberg, Weißpriach and Zederhaus.